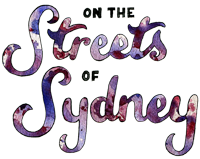 You may have noticed things slowing up a bit this week here at On the Streets of Sydney.com. Yes, we’ve been a little preoccupied: stuffing stockings, singing Christmas ‘muzak’ tunes that have been played on repeat in Myer since mid-November, and reading jokes that come with Christmas cracker victories - the sort of jokes you grin at until you realize they sound eerily similar to ones your dad recounted in 1995. Q: What do you call a woman who stands between two goal posts? Q: What nationality is Santa Claus? OK,OK. Enough groaning. After all, ’tis the season to be jolly! So go get silly (but stay safe!) and we will see you straight after the holidays when On the Streets of Sydney.com returns: Monday, January 3rd, 2011. In the first week alone, we’ll be reviewing the graduate fashion shows that took place this December, profiling the future of Australian menswear, and providing you with more fashion inspiration in the form of street style and The Look. In the meantime, be sure to check out our Editorials, Looks and Street Style photos, as well as the Christmas Gift Guide, for any last-minute ideas. Keep informed about what's happening On The Streets of Sydney every month. Better than a tin-can telephone!